If you ask me to name the best food for improving health and increase strength which is internationally acclaimed, I will suggest the ‘nIrAgAram’ or ‘Pazhaya SAdam’ in Tamil Nadu which is prepared from leftover cooked rice. In my childhood days, daily after we get up, we are give two glasses of this and it had taken care of our health. There was no hot beverage like coffee or tea. My father, grandfather, mother, grandmother were all stronger than their counter parts of the present day and were very active just by taking this. 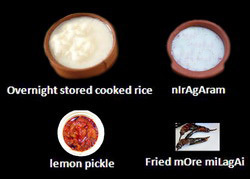 An American Nutritionist, dietitian and scientist had researched on the food practices among various regions in the world and concluded that the South Indian tradition of consuming the previous day’s cooked rice soaked in plain water overnight, in the morning next day, as break-fast, is the best. Nowadays, we cook rice in pressure cooker but in those days it was cooked directly over the fire and the water added to raw rice after boiling thickens and is called ‘Kanji’. This was removed when found in excess to facilitate cooking as otherwise the rice would be overcooked as a paste. This kanji was also very good. Even today in many villages, poor people consume this especially those involved in agriculture and other jobs as labourers. Both these were very delicious and nutritious due to the ingredients added. It is found to contain rare vitamins like B6 and B12 which are generally unavailable in most of the food items or supplements! It is also found to harbor trillions of beneficial bacteria that ferment the rice for adding strength. In fact it is a sort of beer but a good one! It is slightly sour and in the summer it is very tasty if stored in earthen pot. It has many immunity developing agents as well as anti disease properties. The bacteria that grow in the intestines due to this rice safeguard the internal organs and keep all organs battle fit and ready. Consuming this rice helps quicker digestion and wards off ageing, bone related ailments and muscular pains. It also induces sound sleep. When the rice is left over at night, store it in either an earthen pot or vessel and soak it under pure water. The rice cooked should be parboiled or fully boiled one as the grain is full and never use raw rice processed from paddies in rice mills. Close it with a lid to prevent insects entering and store it in a neat and warm place. Never refrigerate. Next day morning, just strain the water and also squeeze the water remaining in the cooked rice. The squeezed rice can be consumed later with curd rice but for our purpose we need the strained liquid only. Add to this a little fresh butter milk and salt. Stir well. You can take it with finely cut onion pieces, chillies or you can mix with it raSam, SAmbAr, mOre milAgAi (fried dried butter chilli), curries, lemon, gooseberry or any other pickle sediments for making it tastier. In the summer you can refrigerate and take cold. If you can do some simple exercises or daily chores after taking it immediately, mingles with the body metabolism. This entry was posted on August 7, 2013 at 11:25 pm and is filed under Kadamba Recipes with tags boiled rice, butter milk, disease fighting agents, earthen pot, gooseberry, Grandma herbal recipes, immunity builder, Kanji, lemon, neeragaram, overnight cooked rice, parboiled rice, pazhaiya sadam, pickles, salt. You can follow any responses to this entry through the RSS 2.0 feed. Both comments and pings are currently closed.